BRANDON, S.D. - July 3, 2016 - Donny Schatz made it an even dozen wins on Sunday night as he battled forward from a fifth place starting position and powered past Joey Saldana at Badlands Motor Speedway to score his 12th World of Outlaws Craftsman® Sprint Car Series victory of the season. Schatz, who last stood in victory lane with his No. 15 Bad Boy Off Road/Chevrolet Performance team earlier this week at Rockford Speedway, won at Badlands with the Outlaws in 2015. "I feel awesome," Schatz said. "It feels great to drive Tony Stewart's racecar. These guys are incredible at what they do." The previous night's winner, Brad Sweet, kicked off the second night of the double-header at Badlands by taking the quick time award in qualifying with a lap of 10.924. Saldana was the beneficiary in the Dash inversion draw and after winning the eight lap Dash race, started on the feature pole in his No. 83 Roth Motorsports car with Dusty Zomer on his outside. Through the early laps of the feature, Zomer and Rico Abreu traded the second position through several laps as Saldana put distance on the field. Eventually, Abreu threw a slider on Zomer on lap five and took over the second spot as the drivers exited on to the front straight. As Saldana began working his way through traffic, Abreu closed on the leader. Behind him, Schatz was making moves, passing Zomer for third on lap 16. Past the halfway point, Saldana continued to work his way through traffic as Abreu and Schatz closed the distance. Abreu, who crashed the previous night while leading the feature, made his move on lap 24 with the slider through turns three and four. Abreu got side-by-side with Saldana but bounced off the wall and allowed Saldana to retake the spot. The next lap, Abreu had Saldana again, side-by-side on the front straight, but he jumped the cushion through turns one and two, giving Schatz an opening to take the second position. With Schatz in second, it was less than a lap before he found his way around Saldana for the lead. Through the remaining laps and one caution, Saldana tried to run down Schatz as David Gravel pulled into third with his No. 5 Big Game Treestands/CJB Motorsports car but Schatz pulled away to claim the win. Saldana and Gravel repeated their previous night's finish of second and third. "We just haven't had the feel we've been looking for," Schatz said. "Every night we get closer to it. The racecar was really good on the bottom, middle and top, and that's why we were able to get through traffic the way we did. Hats off to this Tony Stewart, Bad Boy Off Road, Chevrolet Performance team. I'm just the lucky guy that gets to drive it." 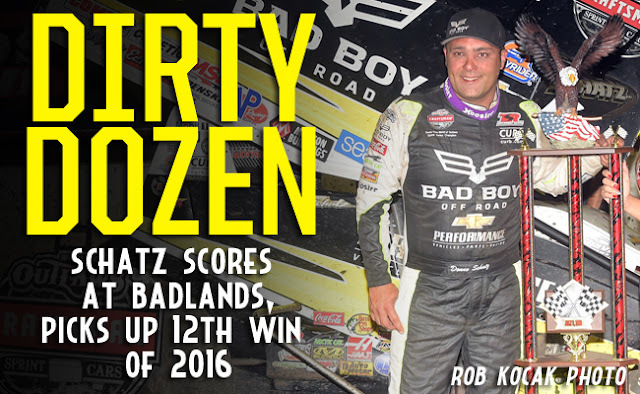 Schatz extended his lead in the championship standings to 95 points over Sweet. Saldana was disappointed in his finish following the feature, in which he led the first 26 laps, but admitted the weekend was a success for his team. "It was a good solid weekend for us - two seconds," Saldana said. "We were close. I just kept running the top which killed my tires. We'll come back next week and hopefully do a better job." Gravel, who claimed his 15th consecutive top-10 finish, said the final caution killed his momentum. "We had a really, really good car there late in the race," Gravel said. "I just wish we didn't have a caution. It seemed like, this weekend, every time we had a caution, the tires aren't the same after that. We'll try to figure that part out. We were really, really good in that long green flag run. I thought we had something for those guys but we're happy with another podium." Jason Sides, who battled Rico Abreu late for the fourth place position, scored the KSE Racing Hard Charger award after climbing five positions in the feature to finish in fifth. The World of Outlaws Craftsman Sprint Car Series kicks off the 'Month of Money' this week as it heads to Cedar Lake Speedway in New Richmond, Wis. for the FVP Outlaws at Cedar Lake on Friday, July 8 and Saturday, July 9. For more information and to learn how to purchase tickets, visit WoOSprint.com/Cedar-Lake-Speedway. RACE NOTES: Donny Schatz scored his 12th World of Outlaws Craftsman Sprint Car Series victory of the season Sunday night - the most of any driver this season… David Gravel has fifteen straight top-ten finishes with the World of Outlaws… Gravel and Joey Saldana scored the same finishes both nights at Badlands Motor Speedway. A second for Saldana and third for Gravel… Jason Sides was the night's KSE Racing Hard Charger, advancing five positions to finish in fifth… One night after a crash sent him to the hospital, Jason Johnson rebounded to take the quick time in the second qualifying flight. CONTINGENCY WINNERS - MSD Ignitions ($25 cash): Cory Mack; MSD Ignitions ($50 cash): Donny Schatz; Penske Shocks ($50 cash): Paul McMahan; JE Pistons ($50 cash): Jason Sides; VP Racing Fuels ($50 cash): Tim Kaeding; Edelbrock ($50 cash): Paul Nienhiser; Comp Cams ($50 cash): Paul Nienhiser; Morton Buildings ($50 cash): Mark Dobmeier; Cometic Gasket ($50 cash): Brad Sweet; Super Flow ($50 cash): Jason Johnson; Craftsman/Sears ($100 cash): Dusty Zomer; KSE Racing Products ($100 product certificate): Jason Sides; Comp Cams ($50 product certificate): Donny Schatz; JE Pistons (Set of Rings): Logan Schuchart; JE Pistons (Set of Rings): Aaron Reutzel. SEASON WINNERS: Donny Schatz - 12 (Volusia Speedway Park on Feb. 14, The Dirt Track at Las Vegas on March 4, Stockton Dirt Track on March 18, Stockton Dirt Track on March 19, Silver Dollar Speedway on April 2, Lincoln Speedway on May 19, Weedsport Speedway on May 22, Lincoln Park Speedway on June 8, Knoxville Raceway on June 11, River Cities Speedway on June 17, Rockford Speedway on June 29, Badlands Motor Speedway on July 3); Brad Sweet - 7 (Volusia Speedway Park on Feb. 13, Volusia Speedway Park on Feb. 14, Cotton Bowl Speedway on Feb. 26, Ocean Speedway on April 1, Bakersfield Speedway on April 15, Plymouth Speedway on May 13, Badlands Motor Speedway on July 2); Daryn Pittman - 5 (Royal Purple Raceway on Feb. 27, Perris Auto Speedway on April 16, USA Raceway on April 18, New Egypt Speedway on May 24, Jackson Motorplex on June 24); Shane Stewart - 5 (Arizona Speedway on March 6, Devil's Bowl Speedway on April 23, Lawrenceburg Speedway on May 30, Granite City Speedway on June 15, Brown County Speedway on June 19); Joey Saldana - 4 (The Dirt Track at Las Vegas on March 3, Devil's Bowl Speedway on April 22, Jacksonville Speedway on May 4, I-80 Speedway on June 22); David Gravel - 3 (Thunderbowl Raceway on March 12, Tri-State Speedway on May 14, I-96 Speedway on June 6); Kerry Madsen - 2 (Eldora Speedway on May 6 and 7); Bill Balog - 1 (Beaver Dam Raceway on June 25); Lance Dewease - 1 (Williams Grove Speedway on May 20); Chad Kemenah - 1 (Fremont Speedway on June 3); Jason Johnson - 1 (Placerville Speedway on March 24); Terry McCarl - 1 (Knoxville Raceway on June 10); Jason Sides - 1 (I-30 Speedway on April 26); Greg Wilson - 1 (The Dirt Track at Charlotte on May 27). World of Outlaws Craftsman® Sprint Car Series Statistical Report; Badlands Motor Speedway; Brandon, S.D. ; July 3, 2016.